Just in case all the indulgent sandwiches this week weren’t enough, I’m leaving you with a few more we must make. 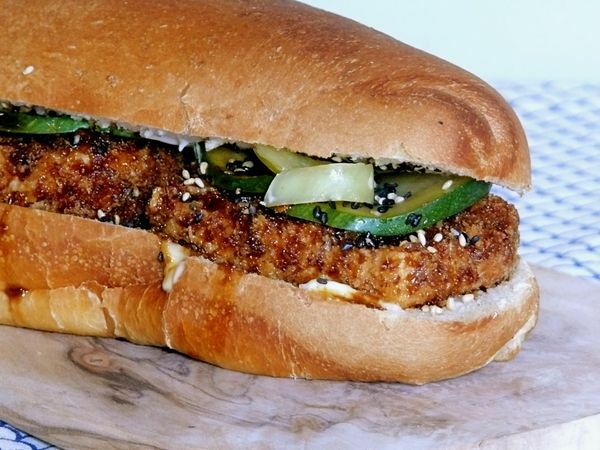 I’ve already tried out the General Tso’s Tofu Sub. It took a lot of restraint to take the picture above before attacking it. It’s pillowy and yields when you bite in, but the flavours are powerfully salty, sweet and tangy. Definitely worth the effort to make the marinade and the sauce for which the sandwich is named. And of course you can use that famous sauce to make many other things as well (I wish I’d doubled it for use in a stir fry). And have you ever heard of a jibarito? It’s a sandwich that uses slices of fried green plantain in place of bread! I love the idea of a grilled cheese jibarito with guava paste and the only reason I haven’t made it yet is because I haven’t gone out of my way to source that paste yet. Soon. Soooon. As for the ultimate grilled cheese, I have to say, it’s gotta be one where the cheese is pressed into the outer sides of the bread. Just imagine the crust that forms as it fries! A fried cheese-bread grilled cheese, essentially. If you missed any of the sandwiches from the most indulgent sandwich week ever, I hope you’ll check them all out–and please, tell me if you tried any of them! Also, pleeease tell me about your most indulgent sandwich creations too. That photo—and your descriptive writing! My mouth is watering. Do you think it would be okay if it wasn’t deep-fried–just lightly sauteed or baked? One of my favorite sandwiches is a veggie Reuben. Also make a mean un-tuna salad sandwich—with tempeh (most people make it with mashed chickpeas, but the tempeh marinated in soy sauce works for me). Ooooh thanks for sharing, Ellen. We need to trade notes on the un-tuna salad (btw, Im totally going to say un-tuna instead of mock-tuna from now on–love that!). I, too, have used chickpeas to get a similar flavour in the past, or white beans and sage. Tempeh in soy sauce you say…I have to try that. The thing about the breading here is that it literally seals/protects the seasoning powder that gets applied first. Plus, of course, the crunch from panko would be missing without it. Having said that, I bet this would still be very good without the breading, but the sugar in the seasoning might burn without the protection of the breading? Id be curious to know how it turns out if you try it. Perhaps baked would be the way to go to avoid burning. I sort of want to try it with super-delicate silken tofu and no bread. Maybe just brush the egg on top, shake breading over it, flip carefully on a wire rack and repeat? I imagine over soft, white steamed rice, with the tso sauce on top, it would be to die for.